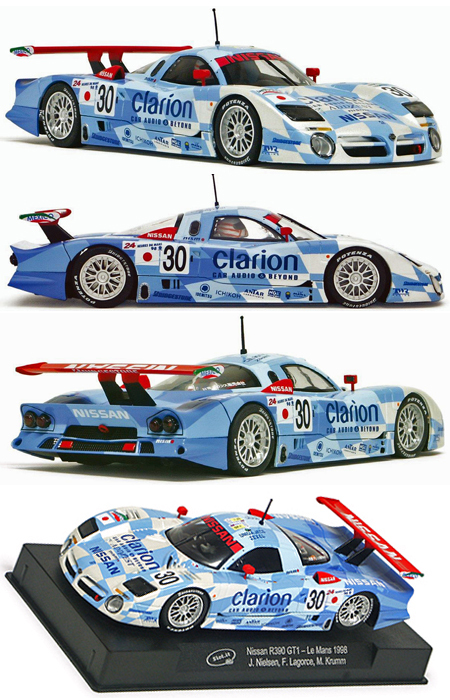 With these cars Allslotcar and Ostorero have done what somebody should have done years ago. 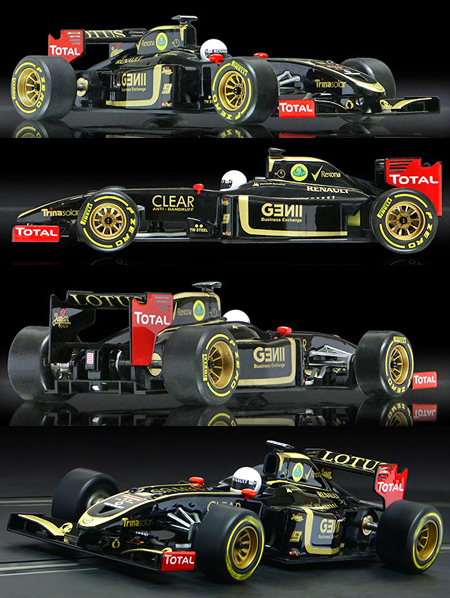 They have taken full advantage of the similarity among current Formula One cars to create an F1 grid consisting of exactly the same car but with liveries for 6 different teams. 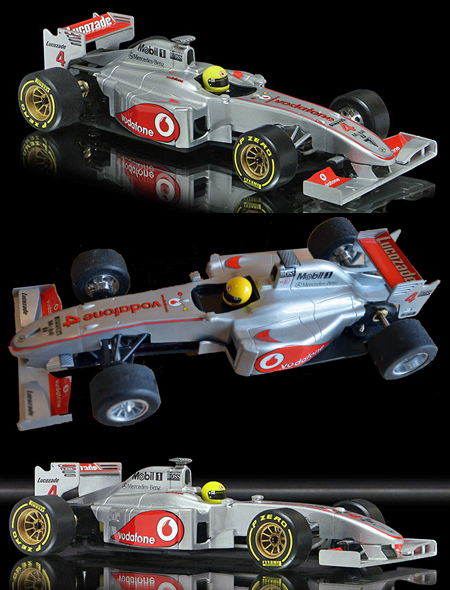 We know that if you took one each of the current F1 cars, painted them all solid white, and parked them side-by-side there would be very few people who could tell you which each of them was. 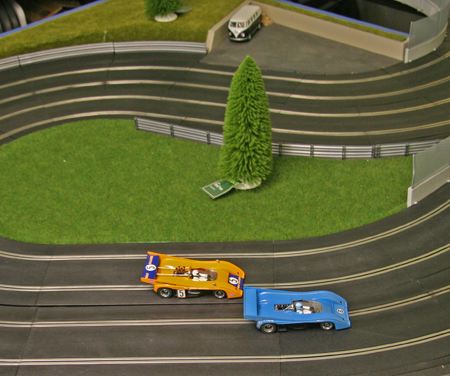 Allslotcar’s approach satisfies the aesthetic sense of all but the true rivet counters while providing slot cars that very much look the part of the teams they represent while benefiting from one set of tooling for economy and providing equal performance across the field for close, competitive racing. 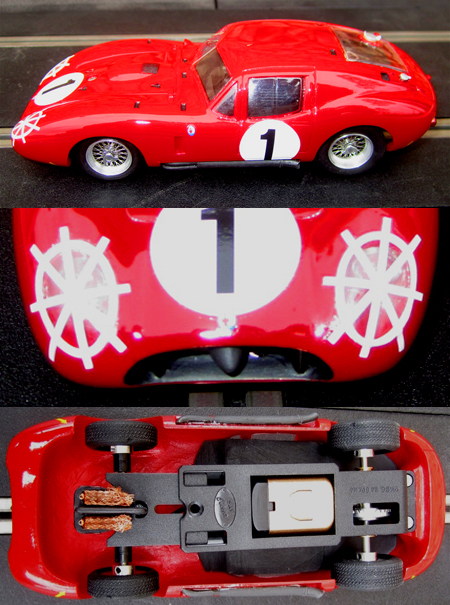 With these RTR cars Ostorero’s master modelers have done the painting, decal work, and assembly for you and done it to a fine standard of workmanship. 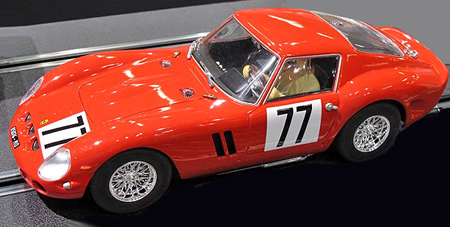 Did you know that we stock 18 different slot car motors priced at $10.00 or less? Configurations include FC130, FK130, FF, and SCX, with RPM ratings from 14,000 to 40,000. Replacing or upgrading the motors on your cars need not be a budget-buster. See our low-priced motors HERE. Since our last update we have spent a lot of time working on downforce. The car has a ton of straight line speed with the Flat 6 motor, but handling is turning out to be another matter. Not that the car isn’t fast; it has turned a best lap time of 5.051 seconds vs. 5.379 for our control car, a brand-new box-stock M20 with sanded stock rear tires. But the car needs about 300 grams of downforce, as measured by the Magnet Marshal, to hit the “sweet spot” at which it can be driven really aggressively into and out of the corners but still does have to be driven. Right now, the best magnet installation we can fit around the Flat 6 provides only 253. That’s the original rear magnet lowered as much as possible by cutting out the bottom of the magnet pocket and CA gluing a piece of thin sheet styrene under the chassis The stock plastic magnet retainer can still be used with a shim between it and the top of the magnet. The MM reading is down from the stock M20’s figure of 289, achieved with two magnets, one aft of the original FF motor and one forward of it. The forward magnet location had to be sacrificed to install the longer Flat 6. 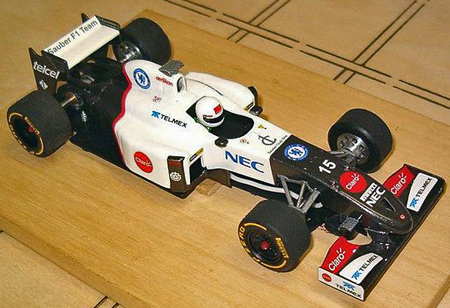 Everything else we have tried produces either less downforce than what we now have or way too much – 400 grams or more. We still haven’t exhausted all the possibilities, but our experience with the M20 so far confirms something we have observed repeatedly in the past — that for optimizing a car for magnet racing the sidewinder chassis layout offers significant advantages over inlines or anglewinders. If we can’t get the downforce we want with the current setup we may have a backup plan. We could just cut off the entire back of the chassis and convert the car to a sidewinder. 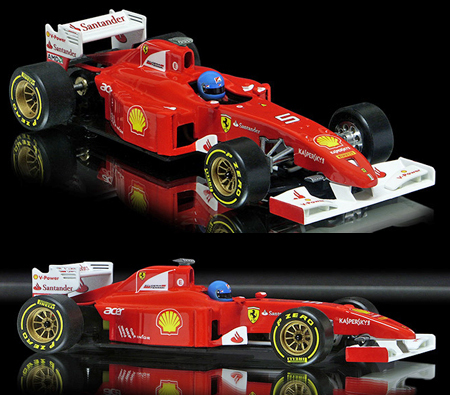 A bit of test-fitting shows that there’s adequate room for a sidewinder FK130 with only slightly narrower rear tires. 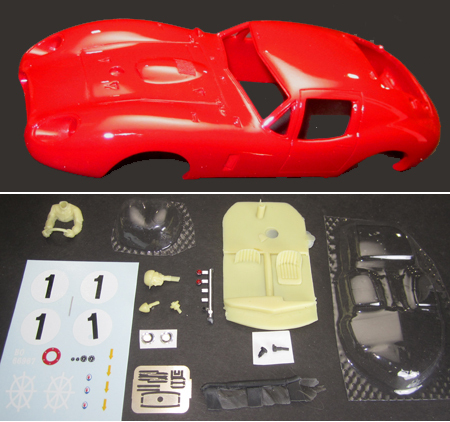 We have already built a couple of CanAm cars using Fly sidewinder chassis, and grafting the back of one to the front 2/3 or so of the M20 chassis does not appear to present any insurmountable problems. The FK130 will require us to raise the rear of the body slightly from where we have it now, but it would just take a shim under each rear body post and would still be significantly lower than stock. We could also use a sidewinder FC130 but we would most likely have to put a small hump in the body to clear the endbell. 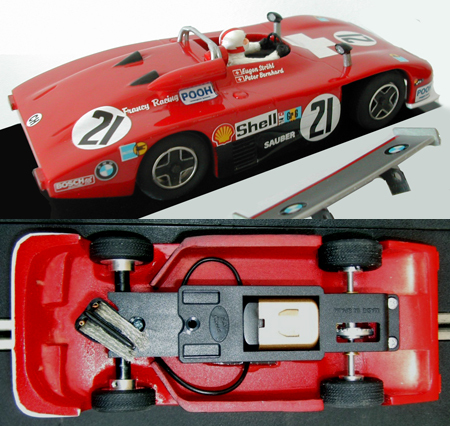 We might also look at the rear sections of certain Scalextric sidewinder chassis that offer the option of a snap-in bar magnet either just forward or just aft of the motor. A note for non-magnet racers… some of the same problems that keep us from putting magnets where we really need them may also make it harder than it needs to be to put weight in the best place. The location of the rear body mounts is one, and the overall shape of the chassis, as constrained by the bodywork, is another. The story continues in future editions of this newsletter. If you have any questions, suggestions, or other comments please send them to support@electricdreams.com.